This post is a bit self-indulgent with quite a narrow focus for our general readers, but who knows? It is specially for John Boulter, a dedicated reader of this blog and who, many years ago, was my sergeant major. Like all good SMs, he was very shouty! 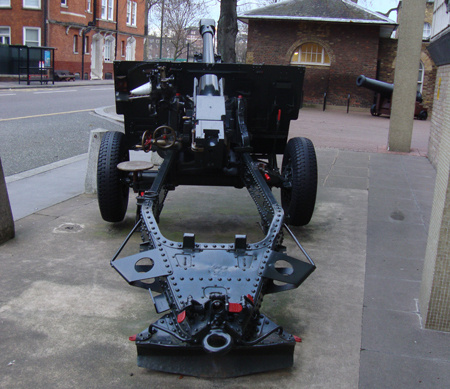 Below are some pictures of a 25 pounder howitzer, one of two positioned outside the National Army Museum in Chelsea, which I visited this afternoon. 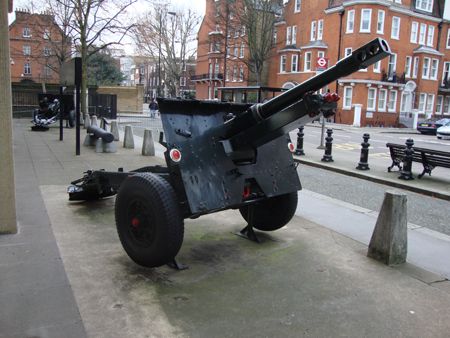 The 25 pounder was developed in the 1930s, manufactured by the thousand, and was a workhorse of the British Army in World War II. It caused the enemy trouble aplenty at El Alamein and in other theatres. It last saw action in the Rhodesian and South African armies of the 1970s and 1980s. Classified as a light- or field-gun, the 25 pounder, as the name suggests, could chuck a 25 pound high explosive shell up to around 11,000 yards with remarkable precision. Its official firing rate was up to six rounds a minute. 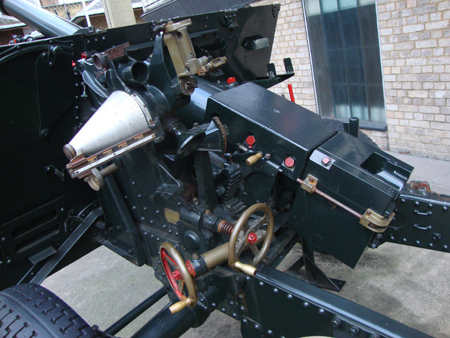 Nominally having a crew of six, three or four experienced gunners could man a gun with reasonable facility. Further reading: Wikipedia’s entry is excellent. 25 pounder. The business end. Missing its platform, which spoils the aesthetic somewhat. From the rear (or trail). You set the range of the target on the silver cone thing. You use your dial sight for aiming (missing, sits in the brass cradle at the top). You turn the brass wheels to set the barrel for elevation and traverse. You pull the trigger (the brass handle between the two red bolts). Boom!